You can purchase access to the video by just clicking on the image and you will be provided the option to purchase access to the video. Checkout My Video From the Exam 1 Session to See What You Think. 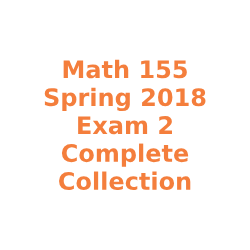 This is the video from the Math 155 Exam 2 Group Test Prep Session that I held on Sunday April 7th, 2019. During the session I cover the entire Spring 2018 Exam 2 from start to finish. The only question I do not cover in the session is question #7 because the material from question #7 will not be on this years Exam 2. The session lasts 2 hours in total, and you can skip around and view as much as you need. You can access the video by clicking on the image below and then purchasing access through the next page. If you have any questions please Contact Me and let me know what you need.